I’ve never been able to sit still so running is a great outlet for me. Finishing Pikes Peak! This marathon was definitely on my lifetime to-do list and I trained hard but the highest altitude I was able to train at was 2500 ft. Rounding the corner to the finish shoot was the best feeling of personal accomplishment. I coached a marathon training team for several years in Richmond and love helping other runners reach their goals- especially first timers. 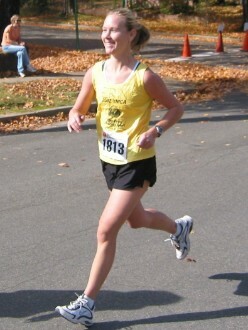 I’m a newbie although I’ve relied on pacers for many of my marathons, including my first time qualifying for Boston. The camaraderie of a pace group really keeps you going when the going gets tough. I love helping others reach their running goals and we’ll have fun along the way! I love talking with other runners and sharing our running experiences and stories along the route- it makes the time fly by! Marathon race day is like Christmas to me- I love to share that enthusiasm! I volunteer with Girls on the Run, support Stray Rescue, the Humane Society, am involved with the United Way.